In my previous post, I noted the Crossway survey on how people read the Bible, but I also noted that they didn't ask what media people use to read it. So I conducted my own survey! It's a small sample size (21), but I suspect it's fairly accurate considering that the respondents are ones who found the link on a Bible and technology blog. The chart above shows the overall weighted scores. 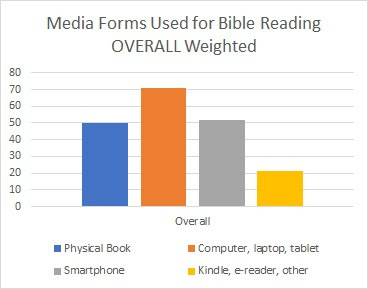 If there is any surprise, it's that hardcopy Bibles are being used as frequently as those reading it on their smartphone. 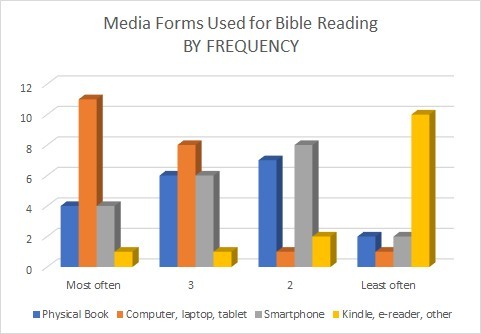 Again, it's clear that physical copies of the Bible are as popular media as smartphones. I will confess that I read the Bible almost exclusively on my home computer / work notebook, but when I'm in church I use my Samsung Galaxy Note 5. The only time I use a hardcopy Bible is when I'm preaching and want to have a visible reminder in my hand that the Bible is my reference.